Entries for the W.A.B. 3.5/7/14 MHz FT8 Contest should be with the Contest Manager by Sunday 5th May 2019. Entries for the W.A.B. 3.5/7/14 MHz RTTY Contest should be with the Contest Manager by Sunday 5th May 2019. Entries for the W.A.B. 3.5/7/14 MHz PSK contest should be with the Contest Manager by Sunday 5th May 2019. Welcome to the Worked All Britain web site. We hope you find the site useful and easy to use. Please click on a heading to the left, or across the top, to proceed. Menu items ending '>>' will expand/contract when you click on them. All official W.A.B. correspondence must go via the Honorary Secretary. For contact details, please see the Committee Page. The published W.A.B. Net Frequencies do not 'belong' to W.A.B. - If a frequency is not in use, then anyone can use them. 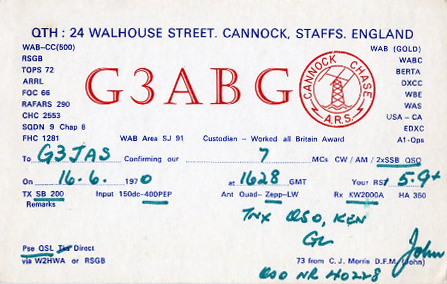 QSL Cards are not required to claim any W.A.B. Awards. However, if a report on a QSO is received from an SWL by any means (e-mail, QSL Card, eQSL etc. ), any Book Numbers they have may be claimed by the station receiving the report. The W.A.B. 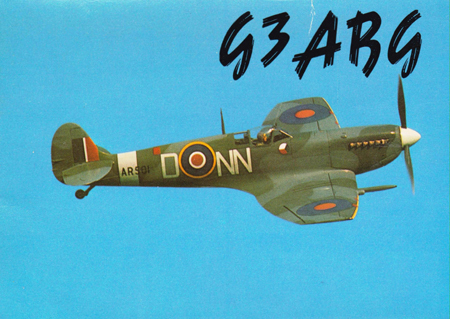 Callsigns (G4WAB & G7WAB) are available for W.A.B. members to use (for a specified limited period of time), BUT YOU MUST CONTACT THE LICENCE HOLDER FOR PERMISSION FIRST to avoid clashes and illegal callsign use. Due to licence limitations, the W.A.B. Callsigns will not be available for use on 5MHz. All nets are controlled by one station acting as Net Controller, who may occasionally appoint backup controllers. Note the one station as net controller. The system of appointing a backup has been shown to work to good effect. Chipping in to "Help" often does not. Only call into the net when the controller asks for check-ins. Unfortunately, experienced WABers sometimes call in during a run-down. This is not really a good example for the newcomer to follow. On very busy nets, check-ins should be asked for once. It is very frustrating if you are a mobile waiting to be picked up if check-ins are asked for three or four times for the previous mobile. Ensure that you are netted on to the net controller's frequency. This is very important at all times. Do not give your W.A.B. information when you work a mobile that is being run down the net. The mobile will want to move on to the next square as soon as possible. Always repeat back the report given to you by the station you are working. This is a check that you have received your report correctly. Signal reports cannot be relayed but other information can. This applies to all W.A.B. activity. There have been occasions when this has not happened. It is more often than not the casual visitor or the newcomer to the net. It doesn't take lot to point this out tactfully and it only needs to be done once. Please don't guess at reports, it is not a valid QSO. Please do not ask the net controller if a report was correct, for example "Was that a 5 & 7?". You should QSL a report, the net controller will tell you whether you have it correct or not. If you are given a report back that is identical to the one you sent, for example "You are also 3 & 3" please do not reply, "QSL the also". This does not acknowledge the actual report, given. The report has no minimum acceptable value. However, signals can never be zero. Always make a list of stations in the net so you know which station to pass transmission to, after working the station that is being run down the net. This is very important for a good flowing run down. Once the run down is started, there should be no need for it to come back to net control, unless it's due to poor propagation between adjacent net members. This can sometimes be rectified by a slight re-ordering of the list. Do not take offence if the controller misses you out in error. Mistakes do happen and remember you could take over net control. Never break in while a mobile is being run down the net. The controller will ask for check-ins at the end of the list. See the comment point 2 above. Mobiles take preference over fixed stations, especially those that have given prior notice of the intended activity. Mobile stations often have a schedule and should not be delayed. Portable stations also take preference over fixed stations. There may be occasions where a portable station should take priority over a mobile due to their physical working conditions. Such circumstances may be due to weather, tides, battery power, limited time availability etc. Which station takes priority is the decision of the net controller, having given due consideration to the circumstances. Do not ask a mobile about the square. The net controller will give the square at the beginning and end of the list. Each net member is allowed two attempts at exchanging reports with the station being run down. If this proves unsuccessful, the station will be allowed a further attempt at the end of the list. Signal reports must be received without assistance. Assistance includes on the air QSPs, relays by any other means (e.g. phone, email, texts etc. ), and the use of repeaters, satellites, remote SDR receivers and remote station operation. It is quite important to stick to this on a busy net with several mobiles. Often a mobile has to get somewhere, sometimes for business, sometimes for pleasure. They don't want to wait around. The net controller may use their discretion to allow further attempts on a less busy net, if it is OK with the mobile. Please remember that the more attempts that are allowed, the more likely it is that the report will be obtained by chance. When there is a gap in mobile activity, the controller will pass down the list to allow members to make calls with other net members. Two calls are generally allowed. If you do not wish to make a call always give your W.A.B. information for the benefit of any S.W.L.s who may be listening. Never waste time with idle chat unless all the other net members have worked the stations they wish to call. This often happens at the start of a time-limited award. Everyone will want to work everyone else and this should take precedence over chat. There will be plenty of days to come when the net controller will be grateful for a bit of waffle to hold the frequency. When poor band conditions make things difficult on a W.A.B. Net, please try to keep calm on air and have patience with all stations. The Net Controller may not be able to hear mobiles or other stations on the net very well. Please do not break in to say that a contact was Valid or Not Valid. At the end of a run down, let the Net Controller know that you may have better copy on stations and ask if they would like you to act as a backup Net Controller. Remember that above all W.A.B. is a hobby designed to give enjoyment to all. Be prepared to do a spell of net control, log for mobiles and use your local knowledge to navigate mobiles. Contest Rules have been slightly amended. See the Contest Rules page for further details. The 6 month restriction on the time limit for claiming Timed/Annual Awards has been lifted, so trawl back through all those old log books and see if you qualify for any of the earlier timed/annual awards (Decade etc.). To progress from one award level to another for an Annual Award (e.g. from Bronze to Silver for the Decade Award), each subsequent claim must be for the same band as the first. Claims for a different band will be annotated as Basic level. If a year is missed, the level will return to Basic. With effect from 1st April,(not a joke), W.A.B. 's postage prices will increase by 50p across the board. We have absorbed several increases over the years, but the one due in April 2019 is the proverbial straw that broke the camel's back. The basic "product" price remains unchanged, so this will not affect the cost of anything at rallies etc. 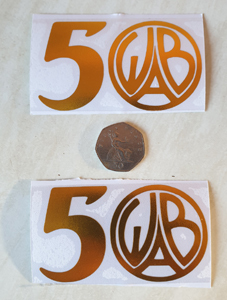 Paul MI1AIB has produced some special 50th Anniversary vinyl stickers. Available at rallies, or use the Price List for your location (links at the top of this page) to order online. For this year's W.A.B. Golden Anniversary awards, extra points can be gained by working/hearing the two W.A.B. Club calls, and the GB50WAB special event callsign. Further details of the awards are on the W.A.B. 50th Anniversary Awards page, and links to the callsign calendars, when they are likely to be activated, are shown below. N.B. Many Stations entered only one contest and are therefore not eligible for the cumulative awards. The 2019 Worked All Britain Annual General Meeting will be held at the Junction 28 QRP Rally, Alfreton Leisure Centre, Alfreton, Derbyshire, on 9th June 2019. John G4LTH has sent a picture of him operating from HW83 on North Rona in September 2017, which can be seen on the Photo Archive page. Roger G0HZK has produced an updated version of his BookFinder program for finding W.A.B. book numbers. See the BookFinder page for details and to download. We have produced a flyer about W.A.B. 's 50th Anniversary in 2019. You can view a pdf file of the flyer here, and more details about the special awards are on the W.A.B. 50th Anniversary Awards page. COMMITTEE AWARDED TROPHIES PRESENTED AT THE A.G.M. W.A.B. Q.S.L. card stocks are being sold off at half price. See the Price List for details (sorry - due to high postal charges, this offer is U.K. only). It has been decided that award entries for Data Modes will have the same requirements as VHF/UHF entries. In celebration of W.A.B. 's 50th Anniversary, we are now selling W.A.B. Golden Jubilee mugs. These bone china mugs are available from rallies priced at just £5-00. They are also available by post (U.K. only), with postage discounts for buying more than one mug at a time (see the UK Price List). We have just received a new batch of W.A.B. Pens, in a nice golden colour. Ideal for writing up your claim for W.A.B. 's 50th Anniversary awards! 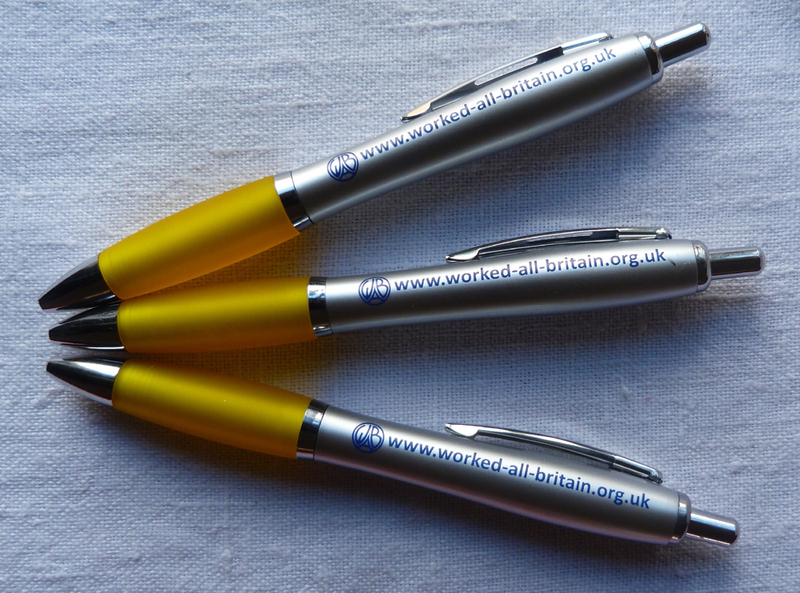 Available at our rally stands, but due to postage costs, they are only available by post if ordering with a W.A.B. Log Book. A query was raised recently about the status of Spurn Head as an island, as due to erosion, it is surrounded at high tide by the sea. The W.A.B. definition of an island states that it must be named, or be part of a named group, on a 1:50,000 Ordnance Survey map (see W.A.B. Definitions). As this is not the case yet, it is not currently being accepted as an Island. This will be kept under review when new editions of the 1:50,000 O.S. map involved is available. G4HPE Steve has been testing this method of spotting W.A.B. activity for a while. This is a new way to report on W.A.B. activity. It is much quicker than the reflector and is suitable for people who don't like using social media. We would be grateful if this method could be tried out to ascertain its viability. You will find the web page at https://tinyurl.com/wabreporter. There is a link from this page to a form for you to enter your own spots, but you will need a validation code which can be obtained from the W.A.B. Yahoo Reflector or any committee member. Please do not misuse the system. There can be a few minutes delay, usually less than 5, from sending the form until it appears on W.A.B. Reporter. The page updates every 10 seconds, so you do not need to refresh the page. Feedback on the system would be much appreciated. National VHF SSB Activity Periods will run on Mondays 2000-2200, Wednesdays 1000-1200 and Fridays 2000-2200 (all clock time). These are activity periods, not contests, with the idea of promoting friendly contacts and having a chat, rather than the frenetic contest formats. They will provide an ideal opportunity to work W.A.B. squares, spread the word about W.A.B., and maybe assist stations to work out their square if they don't know it. Talks on Worked All Britain do not have to be given by W.A.B. Committee Members. If you would be prepared to give a talk to your radio club (or a nearby one), we can provide a Powerpoint presentation plus supporting leaflets etc. Please contact the Secretary (see the Committee page) for more details. Our previous supplier of Polo shirts, Sweatshirts is no longer trading, so we have sourced an alternative supplier. T-shirts, Polo shirts, Sweatshirts & Hoodies are available direct from the supplier Salix Embroidery & Graphics. See the Merchandising page for more details & pictures. Award Pricing: We apologise for the high costs of Awards for stations outside the UK, but our postal service has decided to classify a single certificate as a parcel! However a pdf version is available to anyone for only £1 or €2/&dollar;2. You may then print the certificate yourself. Payment for this method can only be accepted in Sterling coin or via PayPal. Non-UK coins cannot be accepted. W.A.B. have produced special Log Books, with columns for recording the W.A.B. Square of stations. There is an A4 sized home station version, and a new small Mobile version. For details, see the Log Books page. Due to county boundaries no longer being shown on Ordnance Survey 1:50000 maps, and varying definitions of what constitutes a 'county' since Government administrative boundary changes some years ago, the W.A.B. Counties Award is no longer considered a practicable proposition. Don't forget that if you would like to join the Committee, please complete a Committee Nomination form (download from the link at the bottom of the Committee page). CLAIMING AWARDS FROM YOUR ARMCHAIR! A PayPal "donate" button has been added to each page of the web site. This was not the original intention of it, but it's very suitable to use in claiming awards without leaving home. Firstly - email your claim to the Awards Manager (see Committee page), secondly - hit the "Donate" button and submit the amount relevant to your claim. W.A.B. have produced enamel badges with the W.A.B. round logo in either Dark Blue or Magenta. See the Price List for your location. W.A.B. have two designs of QSL Cards printed for sale. For details, see the QSL Cards page.